Relationships after Veron and Winney (2000). Hughes, J. M. and Baker, A. J. 1999. Phylogenetic relationships of the enigmatic hoatzin (Opisthocomus hoazin) resolved using mitochondrial and nuclear gene sequences. Molecular Biology and Evolution 16: 1300-1307. Korzun, L. P., Erard, C., and Gasc, J. P. 2001. 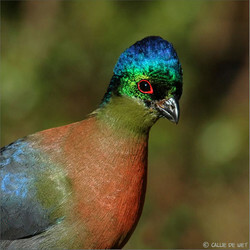 Distinctive morphofunctional features of the bill and hyoid apparatus of turacos (Aves, Musophagidae): their relation to frugivory. Comptes Rendus de l'Academie des Sciences Serie III 324(11):965-977. Turner, D. A. 1997. Family Musophagidae (Turacos). In Handbook of the Birds of the World. Vol. 4. Sandgrouse to Cuckoos. J. del Hoyo, A. Elliott, and J. Sargatal, eds. Lynx Edicions, Barcelona. Veron, G. 1999. Phylogeny of turacos (Aves, Musophagidae). Analysis of morphological characters. Journal of Zoological Systematics and Evolutionary Research 37(1):39-47. Veron, G. and Winney, B. J. 2000. Phylogenetic relationships within the turacos (Musophagidae). Ibis 142: 446-456. Page: Tree of Life Musophagiformes. 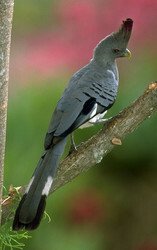 Musophagidae. 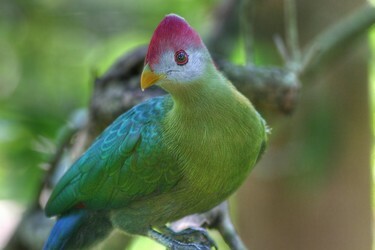 Turacos, Go-away-birds, Plantain-eaters. The TEXT of this page is licensed under the Creative Commons Attribution-NonCommercial License - Version 3.0. Note that images and other media featured on this page are each governed by their own license, and they may or may not be available for reuse. Click on an image or a media link to access the media data window, which provides the relevant licensing information. For the general terms and conditions of ToL material reuse and redistribution, please see the Tree of Life Copyright Policies.